We already looked at Market Basket Analysis with R. Collaborative filtering is another technique that can be used for recommendation. Assume Person A likes Oranges, and Person B likes Oranges. Assume Person A likes Apples. Person B is likely to have similar opinions on Apples as A than some other random person. The implications of collaborative filtering are obvious: you can predict and recommend items to users based on preference similarities. There are two types of collaborative filtering: user-based and item-based. Item Based Collaborative Filtering takes the similarities between items’ consumption history. User Based Collaborative Filtering considers similarities between user consumption history. We will look at both types of collaborative filtering using a publicly available dataset from LastFM. The data set contains information about users, their gender, their age, and which artists they have listened to on Last.FM. We will not use the entire dataset. For simplicity’s sake we only use songs in Germany and we will transform the data to a item frequency matrix. This means each row will represent a user, and each column represents and artist. For this we use R’s “reshape” package. This is largely administrative, so we will start with the transformed dataset. Download the LastFM Germany frequency matrix and put it in your working directory. Load up R and read the data file. We then want to calculate the similarity of each song with the rest of the songs. This means that we want to compare each column in our “data.germany.ibs” data set with every other column in the data set. Specifically, we will be comparing what is known as the “Cosine Similarity”. Note: For loops in R are infernally slow. We use as.matrix() to transform the columns into matrices since matrix operations run a lot faster. We transform the similarity matrix into a data.frame for later processes that we will use. We have our similarity matrix. Now the question is … so what? We are now in a position to make recommendations! We look at the top 10 neighbours of each song – those would be the recommendations we make to people listening to those songs. Then we need to find the neighbours. This is another loop but runs much faster. We sort our similarity matrix for the artist so that we have the most similar first. [,1] [,2] [,3] a.perfect.circle "a.perfect.circle" "tool" "dredg" abba "abba" "madonna" "robbie.williams" ac.dc "ac.dc" "red.hot.chilli.peppers" "metallica" adam.green "adam.green" "the.libertines" "the.strokes" aerosmith "aerosmith" "u2" "led.zeppelin" afi "afi" "funeral.for.a.friend" "rise.against"
This means for those listening to Abba we would recommend Madonna and Robbie Williams. Likewise for people listening to ACDC we would recommend the Red Hot Chilli Peppers and Metallica. We will need our similarity matrix for User Based recommendations. We can start by creating a helper function to calculate the score mentioned in the last step. The loop starts by taking each user (row) and then jumps into another loop that takes each column (artists). We then store the user’s name and artist name in variables to use them easily later. We then use an if statement to filter out artists that a user has already listened to – this is a business case decision. The next bit gets the item based similarity scores for the artist under consideration. It is important to note the number of artists you pick matters. We pick the top 10. We store the similarities score and song names. We also drop the first column because, as we saw, it always represents the same song. We’re almost there. We just need the user’s purchase history for the top 10 songs. We use the original data set to get the purchases of our users’ top 10 purchases. We filter out our current user in the loop and then filter out purchases that match the user. Once we are done we can store the results in a data frame. This basically reads that for user 51 we would recommend abba first, then a perfect circle, and we would not recommend ACDC. We will create another holder matrix and for each user score we will sort the scores and store the artist names in rank order. By sorting we see that actually the top 3 for user 51 is the subways, the kooks, and the hives! Actually it really depends on your data … but the cosine similarity is used for similarity among non-binary vectors too. You can opt to use the same method described in this post with another similarity function (here are a few: http://mines.humanoriented.com/classes/2010/fall/csci568/portfolio_exports/lguo/similarity.html) one of which could be Pearsons’s coeff. Salem, thank you so much for your detailed explanation of collaborative filtering. Here, you have dealt with data which is binary (0s and 1s). However, what if the recommendations are to be made on the basis of data which gives the number of times an user listened to a particular artist? Not only 0s and 1s but 0 to any range. It will range up to the number of times that particular user listened to that artist. Maybe this scenario does not make much sense in a music recommendation app, but lets say we have purchase or sales data? One user might have a very high affinity to a certain product or certain groups of product. Does the reco engine change in that case? I have tried running your code with the provided data set. Do you have any tips, advice or comments on how to make it run faster? Lets say in cases where there are over 10,000 users! In that scenario does the process of K-Means clustering come into place? If so, could you briefly describe how to go about such a case? There is no reason why you cannot create a matrix of the number of times a user listened to an artist and create a similarity matrix from that – the scores will adjust based on the similarities. It is extremely slow because of the for loop that I use in the code. For loops are the arch enemy of R 🙁 if you have a large dataset I would recommend you port the (part) of the code to python which runs much faster. There is probably a smarter way to do the for loop bits. Any suggestions on how can I do this successfully? To be honest I do not know how to improve the performance of the for loops in this code with R.
I would recommend using more processing power either on your machine (what OS are you using, I can give you hints on how to dedicate more memory to R) or send it to the cloud (Amazon has this service). I also recommend you try porting the data processing bit to Python which is a lot friendlier with loops of this sort (I might just make a port of this snippet since it seems to be getting popular). I know this is not much help but I hope it puts you on the right track at least. Let us know how you solve it. Is it this true?, because Salem didn’t say anything about. Can you help with that, please? Are you using a different data set? If you are please share it so I can try and see where things are going wrong. That message usually means there are null values causing a problem somewhere. Interesting to see this as R has so few examples for collaborative filtering. I’m running a recommender that produces recommendations for nearly 100K users against a similarity matrix with nearly 1M. You need to avoid for statements entirely and rely on apply functions preferably with parallelization down to reduce processing times. I’ve got ours runs down to 1-2 hours daily. Thanks! Can you suggest an edit? Thanks for the code! but any help please you tell us the script of creating the frequency matrix because it is the first step! This depends on your data set and how it is formatted. The purpose of the post is to demonstrate collaborative filtering in R. If you would like consulting or work done for you on data munging please feel free to email me and I can offer you those facilities at a standard daily rate. I have not your email. Is it possible for you to share the code? I am also dealing with huge data, so it will be helpful for me. I am using User based collaborative filtering. Can you please suggest how can I include demographic similarity between users while creating recommendations in addition to what is already being considered. I have gone through the white paper but still not able to figure out how to merge this probability with user demographics similarity. Thank you very much for your R script. can you tell me yours email. can you tell me your email. For the part “User Based Recommendations” I run your code but R still turns (more than 2 hours) ,I am still awaiting the execution result of R ; this is normal ?I am still awaiting the execution result R, there is a mistake in your code ? I know this is old, but you can always imbed one or two print statements in a (non-parallel) for statement to see its progress. I ran this on 1500 products and 13,000 users. It took a couple of days but I could see the progress from the RStudio command line. I not good at writing function, the one big ugly nested loop, will you able to write a function for this. I want to test the code’s performance under the package SNOW for a data of 30000 observations into 200 variables. Many thanks for your perfect explanations. Happy to help Arghavan, thanks! can you pls specify the significance of ncol=100 in the above code??? If I’m dealing with a sparse matrix, might I want to substitute “if(as.integer(data.germany[data.germany$user==user,product]) == 1)” for something more like if(!is.na(data.germany[data.germany$User==user,product]))? As it stands, I’m getting an error (missing value where TRUE/FALSE needed). With respect to my prior post, if my assertion is correct, shouldn’t the next line be: holder[i,j]<- data.germany[data.germany$User==user,product]? argument is of length zero”. I am using another dataset, with binary data…maybe is because over the 80% is zero? Thank you for wonderful explanation. I have a question on user-based filtering. 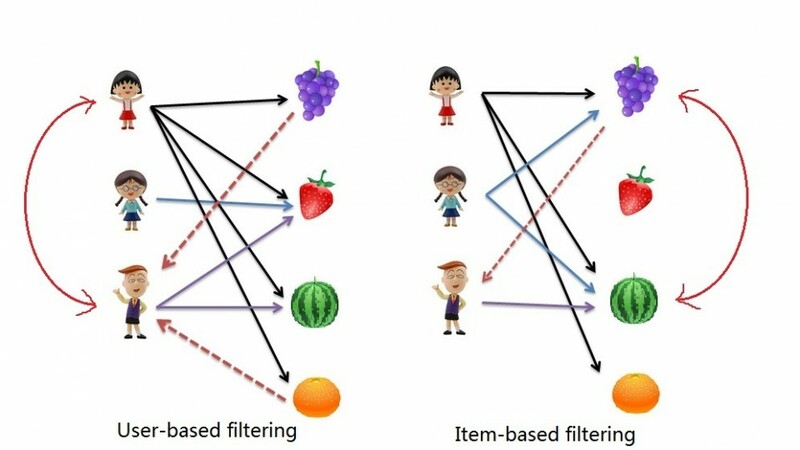 Pictorial depiction on top of your article shows that we are recommending grapes and orange to 3rd boy because this boy is similar to 1st girl because of 2 common fruits among them water-melon and strawberry. However, in your code and explanation for user-based filtering you are no doing any user-to- user similarity calculation and only using cosine similarities calculated for item based filtering. Please help me in understanding this. I have read another article which is based on rating scores and it calculates cosine similarities for user while applying user-based filtering. Please help me in understanding the difference between two examples. I understand we are using item to item similarity. Is it a User based recommendation based on his purchase history? Thank you for your post. This was really helpful. My question is based on this current methodology, how do you evaluate the recommendations? More specifically, how can one calculate the MAE/RMSE for the recommendations? Many thanks for your explanation. Must appreciate. Can I ask if this is similar to the recommenderlab package in R? and how do you suggest to validate the results it gives..like its recommending in a order for each user what he should most likely want. There should be a way for validation.In my case I am using super market data and recommend products to customers. i have used ur code in my R Studio.how long it will take? Hi, how can I evaluate the accuracy of recommendation using MAP(Mean Average Precision)in this dataset ? If I divide the dataset into test data and training data, I don’t know how to rank the test data. very useful post, thanks so much. – Where reside the data? I mean, how would be the big picture of the architecture? – Where is the matrix store? – Suppose I have data about the users in a relational database, how would it work? – Do I have to run the code with the online user together with the stored data and then obtain the recommendations? My questions are maybe too general, but any comment would be highly appreciated. How do you calculate MAE or any performance statistic in this case? Thanks for clear explanation. I work in a country wherein there are multiple religions, and there are few singers who sings for multiple religions. I can’t recommend a song on the basis of singer or song only ( chances to recommend a song of other religion can’t be ruled out). Please help me to add a religion column in same example. Hi, Thanks for the code, I saw the same Raj said. I think you missed the comma when you calculate the cosine in the loop. Am I missing sth? I’m curious now because you haven’t corrected. Maybe I’m wrong. Thanks again. I don't understand what you are trying to do there but anyway, the filter won't work that way. "user" was the name of the user and c("user") it's only the word "user". Would you please explain what were you trying to do in that step? i facing error after running above code .Code line# Get the top 10 neighbours for each kidly guide me on this …!!! Hey ….i got the solution for that …. actually how should be the approach for data collection …for explanation take example song recommendation itself ..Can you explain the pre processing step before matrix formation..it will great help /.. I am facing the same issue with the code. How did you get it to work? Thank you, well in advance. Thank you so much for your detailed explanation of collaborative filtering. can you share your views to my email id . Thanks a lot for this post. Algorithm and explanation is brilliant! In your method we are making recommendations for all the users. Would there be a way to provide a threshold so that users with only top scores would get recommendations. Would you have an idea about how these thresholds could be set? For User based collaborative filtering, can you please you apply function, edit the code & publish? It’s taking huge amount of time to run. But how is the similarity measured? It must be obvious, but i am not getting it from looking at the function. I know how it works for two sentences. I find it a little confusing now to say the least. I found the explanations a little confusing when compared with implementation. However, I withdraw my comment earluer as I gave seen the light. Anyway, I would add lack of content awareness for Recommender Systems. IS the any way to handle the big data problem? sparkR have any limit of data size to handel the big data ? # Optimization 1: Work with a logical matrix instead of a numeric one, because logical functions are faster. # Optimization 2: It's not neccessary to use the (costly) sqrt function here. # Optimization 3: Calculate only the upper half of the simularity matrix for now. # The distance of a vector to itself is always 1, no need to calculate that. # Because the distance function is symmetric we can set the values in the lower half of the matrix according to the already calculated values of the upper half. However, I’m getting this error in the huge ugly for loop. Could you help me solve it? Can you please tell me when to use market basket analysis and collaborative filtering?small example will be a great help. Cool tutorial, thank you! Though it may be useful to offer an alternative solution to the nested for-loop. As we all know, R is quite slow in loops and way fasted when using vectorized apply-type functions. Therefore, instead of using a second loop, one can use an “apply” function instead, which speeds up the process tremendously. Is it possible to vectorize this operation as well? Thanks a lot for your help!